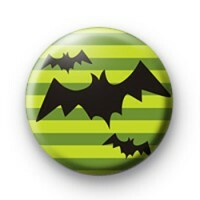 Flying Bats Button Badges with light a dark green striped and 3 spooky black bats. These bat badges are perfect for Halloween and spooky enough to add to any costume our Halloween outfit. These look great pinned to your school unfirm or blazer and are popular with teachers at Halloween. Also, perfect to hand out to trick or treaters along with sweets and chocolate. We have a huge range of Halloween badges available in our Halloween button badge category so be sure to check them out and stock up for Halloween this October. 25mm badge made in the UK.